Salted maple candied pecans are a hit. I made a double batch and sent them into City Hall with Mr. Joybilee today to see if the ladies in the office liked the flavours of celtic sea salt and organic maple syrup together. They did. So now that these candied pecans have passed the scrutiny of City Hall, I think I can safely share the recipe with you. Start to finish they can be out of the oven and on the cooling racks in 1 hour. Cool and ready to package in a couple more hours. 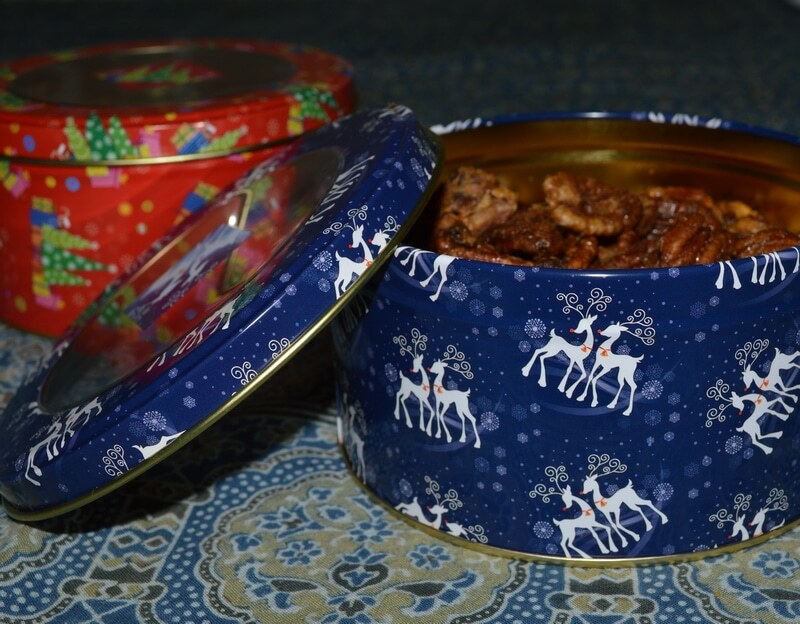 One batch makes 4 small tins of delicious candied pecans. The salted caramel flavour is not too sweet. Grab your bowl, a whisk, and a spatula, and lets get started. This recipe uses a 2 lb. 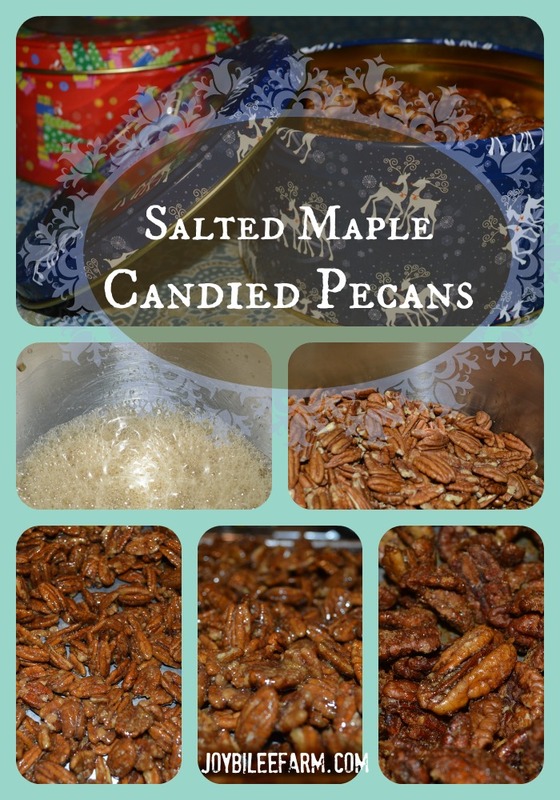 bag of pecans and makes 4 – 3 cup tins for gift giving. It will take you 15 minutes to mix the nuts and 45 minutes to bake them. You’ll need to stick around and stir them twice during the baking time. Candied pecans are a lovely hostess gift, neighbor gift, or stocking stuffer. Consider serving them as a snack on Christmas eve. Make a batch to take to the office, like I did. The flavours of Celtic salt and maple sugar are better than salted caramel. Salty with just a hint of sweet maple flavour. Mix egg whites, vanilla, maple syrup, and water in a 2 quart bowl. Stir briskly with a fork until lightly frothy. Add pecans and stir well to completely coat. Allow pecans to absorb some of the liquid for 5 – 10 minutes. Sprinkle maple sugar over saturated pecans. Stir well, by hand, until maple sugar is evenly distributed. Do not be so vigorous as to break the pecans. Pour out on buttered baking sheet. Spread into a single layer, leaving some pecans touching others, if you want them to clump together after baking. Sprinkle coarsely ground Celtic Salt lightly over the top of the pecans. 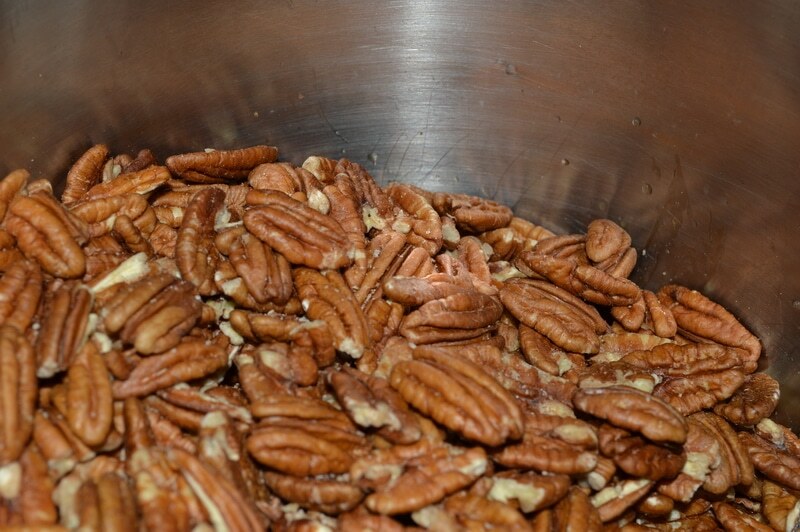 Preheat oven to 275*F. Bake pecans for 45 minutes, stirring every 15 minutes, until golden brown and dry. Remove baking tray from oven and put on to a cooling rack. Allow pecans to cool completely before storing in an air tight container. To package for gift giving, place in cellophane bags and tie with a cheerful ribbon. Place filled and sealed cellophane bags in a cookie tin for gifting. Alternatively fill a mason jar with the candied pecans. Cover with a bright piece of gingham or a seasonal printed fabric. Close with a lid and seal, and tie with a holiday ribbon. Yes, you can certainly use Kosher salt. Celtic sea salt is harvested in France. Any sea salt or even Himalayan salt works. Avoid using regular tablesalt. Is Maple Sugar a granulated sugar? Would sucanat work instead? Yes it is. It gives the maple flavour without chemical flavourings. You can use any sugar in this recipe, but you won’t get the same flavour. is there an alternative to egg whites? The eggwhites make the sugars stick. I’m not sure how they would turn out without them. You could try aquafaba – the liquid from a can of cooked chickpeas. I plan on trying that. Hi Chris…..Where might one find the maple sugar. I live in California and have never seen it in the stores? Online?? Oooh, I love pecans and these look divine!